Happy Friday everybody! I am so glad that this week is over and to have some super fun plans just ahead for the weekend! Hanging out with friends, going to brunch, going to the symphony, and more! But first, I wanted to share a few things (five to be exact!) that have been on my radar this week. 1. It is Girl Scout cookie season. And to quote Kevin Malone, “nothing beats the cookie season, that’s the truth.” (If you don’t know what I’m talking about, you have to watch this 20 second video. Do it. Right now.) 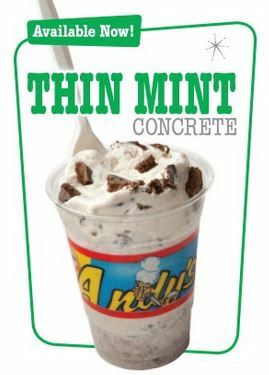 And with Girl Scout cookies comes one of the best things known to man: the Andy’s Frozen Custard Thin Mint Concrete. This was by far one of my favorite Andy’s treats (second only to the pumpkin pie concrete offered in November) and I have been craving one of these bad boys for months now!! I thought my Andy’s days were long gone when I moved up to St. Louis, but lo and behold there is one up here and close by in Kirkwood! The close proximity + the free gift card they gave me for my birthday = ice cream time. 2. The Veronica Mars movie comes out TODAY! I watched a few episodes of the show back when it was on, but never really got into it (I was busy with life and school and completely hooked on Gilmore Girls) until about two months ago. I had heard some friends talking about how excited they were for this movie to come out and they told me that I should watch the whole show. So I did. And it was awesome. 3. I’ve decided that I want to be a “brunch person.” I love the idea of spending a leisurely morning with friends, eating delicious food, catching up, and I’m sad that I haven’t done this more often. A few weeks ago I went to Saturday brunch with my friends Allison and Seth at Rooster and it was delicious! I had one of their breakfast crepes and man was it filling! I highly recommend going here if you don’t mind waiting a few minutes to be seated (comparable to waiting for Gailey’s for my Springfield friends) – it will be worth the wait! 4. Buzzfeed quizzes are my new favorite thing. They are silly and fun and have helped me “learn” a lot about myself. Like…. One more bonus thing that I’m loving right now: the start of spring! I have the windows open in my apartment right now and the fresh air is so nice! I can’t wait for the weather to get just a smidge warmer, that will be even better!